Diana was born and raised in Toronto & Mississauga. 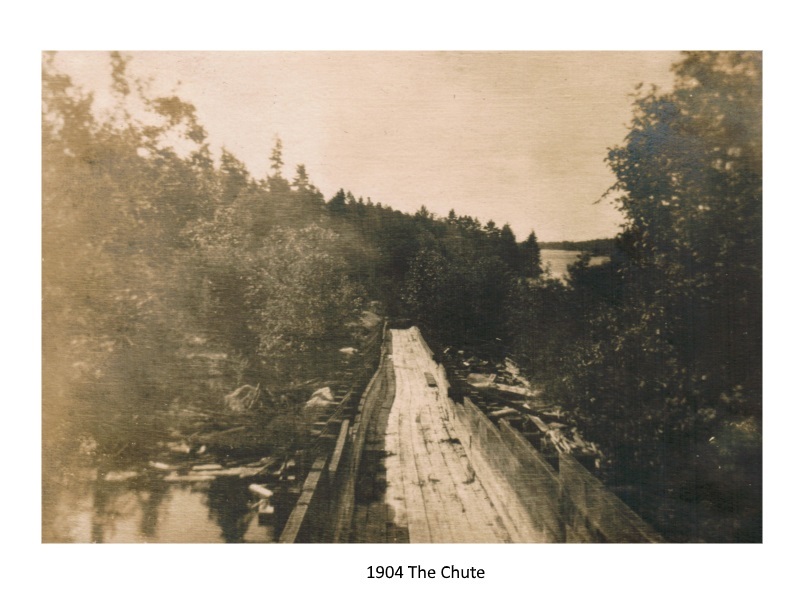 She spent some of her summer vacations in cottage country, so she has always been drawn to nature and especially the water. As a child Diana and her cousins, influenced by the movies Splash and the Little Mermaid, would often pretend they were mermaids when they were swimming. 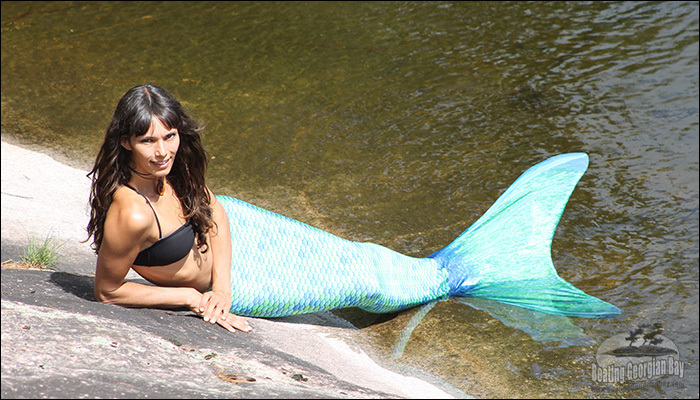 Diana constantly finds herself daydreaming of splashing around in the Bay in her Mermaid tail. If you have never believed in Mermaids ... one look at Diana will convert you. 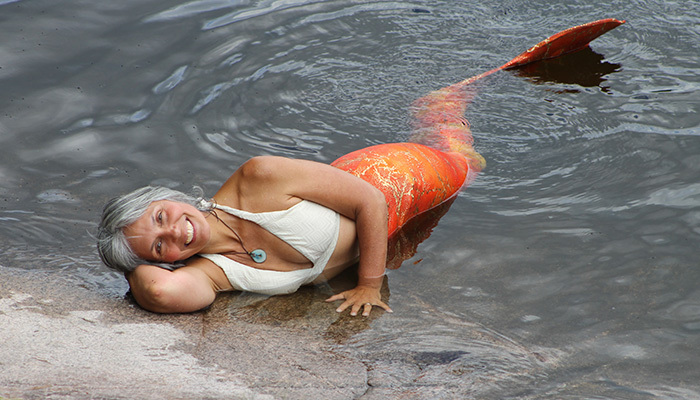 In addition to being a Mermaid, Gail Holness is our co-host for Boating Georgian Bay TV. Gail is also a yoga instructor www.holness-yoga.com and she along with her husband Mike run a yoga studio with guest suites for Yoga retreats. She even did a stint in India where she studied yoga and more lately she is studying human biology ... she knows a lot about coaching people in healthy lifestyles. Being a Yoga instructor she is also as flexible as a rubber band and she easily adapts to the Mermaid swim style. On land or in the water, Gail is always cheerful with a great beaming smile, and full of life ... and she the loves the freedom of being a Mermaid every chance she gets. This is Mermaid Cheryl. She was born and raised loving the sand and surf on the beaches of sunny southern California. In her early 20s she met her Canadian husband and moved to Canada. They live along the shore of one of Ontario's beautiful lakes in the Haliburton area. Together they have raised one very wonderful son, Stan who is now 17. A hard worker and a devoted mother, Cheryl is also a true sun worshiper and enjoys everything about nature and being outdoors. She especially loves gardening and Yoga. 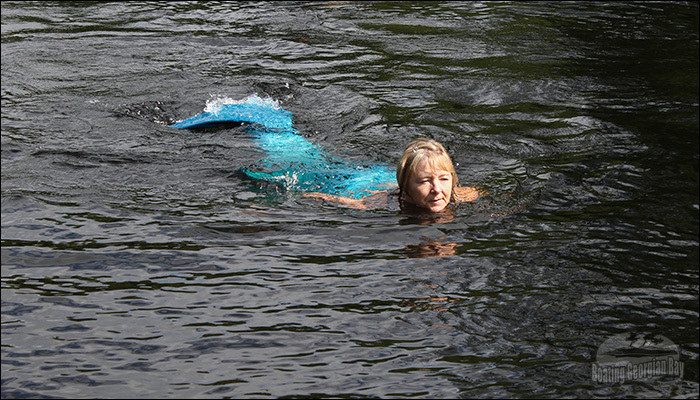 Her first Mermaid swim was like a step back in time and Cheryl felt incredibly comfortable gliding under and along the surface of the water. Fun loving and up for anything, Cheryl always looks forward to Mermaid swims. This is Mermaid Doreen. She's up for anything ... the life of the party. Doreen makes music with spoons and she tells awesome jokes. Doreen is a Newfie ... and proud of it. But now she lives in Ontario with her family and one of her favourite things is swimming around in a tranquil cove in full Mermaid mode. 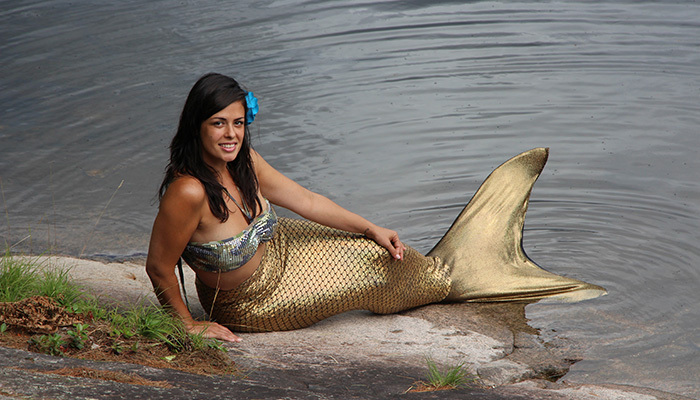 Coming from Newfoundland, Doreen has a Zen like attraction to the water ... and being a Mermaid comes naturally to her. If you are out there fishing some day on a quiet misty morning, and a blond Mermaid with a baby blue tail swims up to the boat ... say hello, that would probably be Doreen. Holly Bonilla always dreamed of being a Mermaid and moved to Mexico in 2003 to frolic in the surf. Until 2010 Mermaid Holly was living on the beaches near Los Cabos Mexico teaching surfing, fishing and raising little Mermaids with her husband, Mexican surfing champion Pablo Bonilla. Holly and her husband now run SUPNorth and the business focuses on Paddle Canada Certified stand up paddleboard (SUP) lessons, SUP tours, SUP kids camps, mermaid swims, water based events and custom week long beach/surfing retreat excursions in Baja Mexico. Most of our viewers are aware that stand up paddle boarding has become very trendy ... and many yachts carry SUP's as standard equipment now for play time at anchor. If you really want to easily learn stand up paddle boarding the right way take some lessons from Holly & Pablo ... so you can show off in the anchorage, contact SUPNorth (705) 754 0716. Holly loves being a Mermaid and she frolics in Ontario waters every chance she gets. Boating Georgian Bay™. Copyright protected. All rights reserved.